This dish never gets old, so here it is again. 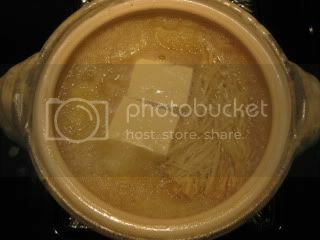 When the tofu is steamed in donabe steamer, "Mushi Nabe", the flavor become richer. All I need to do is just get the sauce and topping ready. Steam the ingredients (add the shungiku at the end). And once it's ready, enjoy immediately. Whisk together the ingredients for the sauce. Set aside. 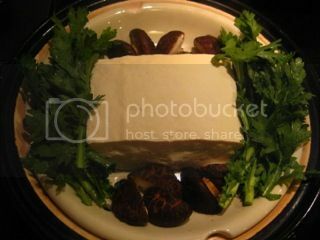 Get "Mushi Nabe" ready according to the basic steaming instructions. 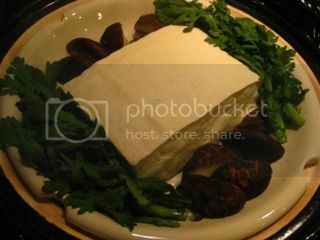 Place the tofu in the center of the steam grate. 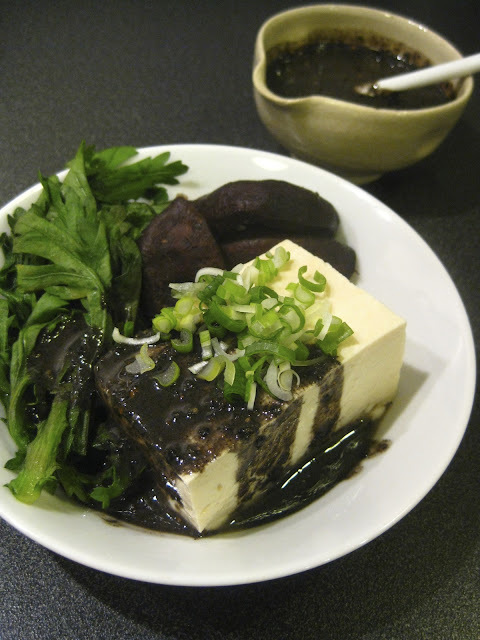 Arrange the shiitake mushrooms in two opposite sides of the tofu. Cover with lid and steam for 8 minutes or until the tofu is heated through and mushrooms are cooked over medium-high heat. 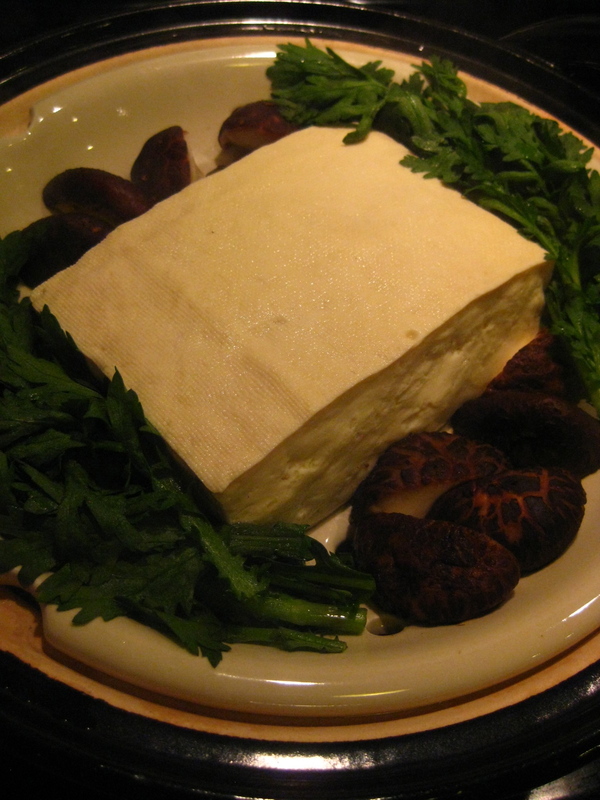 Add the chrysanthemum leaves in the the other open sides of the tofu. Cover again and cook for 1 minute. Slice the tofu and serve into individual bowls with the mushrooms and chrysanthemum leaves. Pour the sauce and sprinkle some scallion to serve. 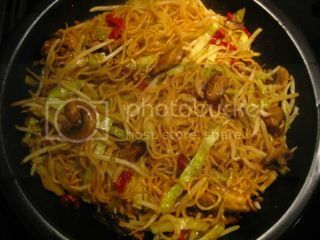 Here's another "Yakisoba" (Japanese stir-fry noodles) recipe with tagine-style donabe, "Fukkura-san". With the spicy curry and umami-rich oil-marinated sun-dried tomatoes, this completely vegan yakisoba can make even meat lovers happy. 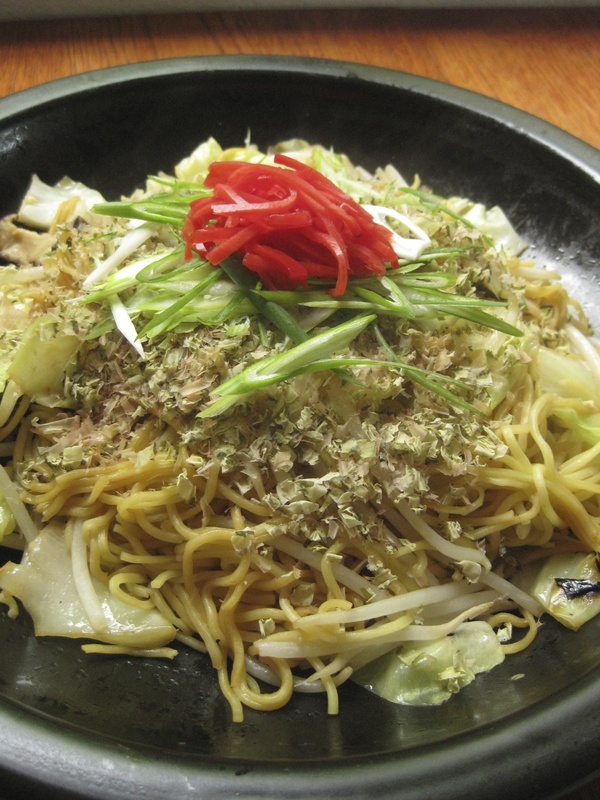 With the steam-fry effect of "Fukkura-san", the result is really fluffy smooth noodles. My kind of street-ey food. Let the noodles stand-by in the lid of "Fukkura-san". 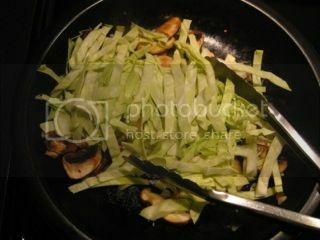 After sautéing the shiitake and garlic, add the cabbage. 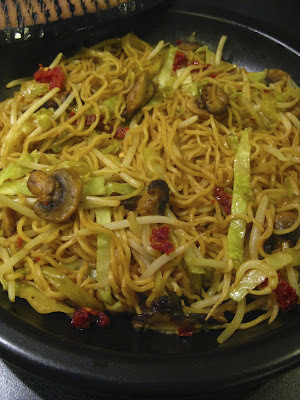 Make piles of yakisoba noodles and bean sprouts. Pour the sauce and steam-fry. To finish, add the sun-dried tomatoes and stir. In the lid of "Fukkura-san", gently loosen the yakisoba noodles. Set aside. In a small bowl, combine the ingredients for the sauce. Set aside. Heat the sesame oil in the skillet of "Fukkura-san" over medium-high heat. Add the garlic and shiitake mushrooms. Sauté until the shiitake mushrooms are soft (2-3 minutes). Add the cabbage and stir for 30 seconds. 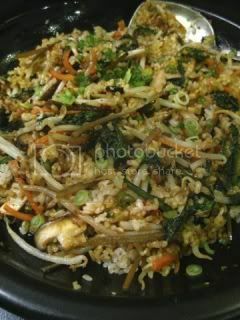 Add the yakisoba noodles to make a mound. 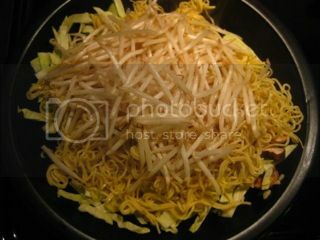 Add the bean sprouts and spread over the noodles. Drizzle the sauce all over the piled ingredients. Cover with lid and cook for 5 minutes. Add the sun-dried tomatoes and stir. Cover again, turn off the heat and let it rest for 3 minutes. Garnish with thinly-sliced scallion. Serve into individual bowls and drizzle a little "la-yu" if you like. 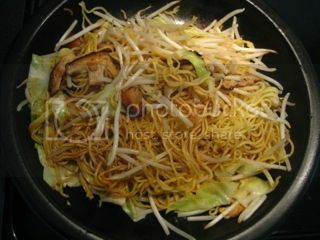 Once in a while, I have cravings for very simple "Yakisoba", which is Japanese stir-fry noodles. 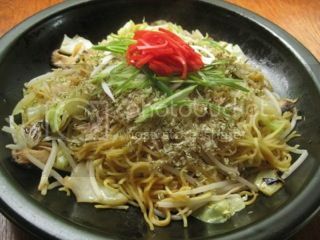 "Yakisoba" is a very popular street food in Japan, and the basic style "Yakisoba" is flavored with Japanese version of Worcestershire sauce or something similar. Because it's stir-fry, "Yakisoba" is often quite greasy. 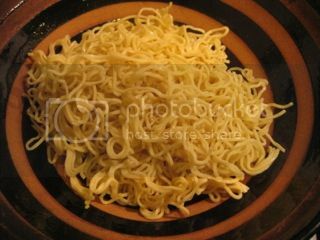 But, with tagine-style donabe, "Fukkura-san", with just a small amount of oil and its steam-fry effect, my "Yakisoba" becomes so fluffy and light body. Also, for the sauce, I do a simple blend of oyster sauce and soy sauce. Main ingredients to cook with the noodles are just vegetables, but if you like it meaty, you can stir-fry some slices of pork belly before adding the noodles. Garlic and shiitake mushrooms are sautéed in sesame oil. 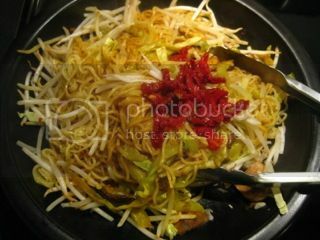 Cabbage, bean sprouts, and yakisoba noodles are added. Sake is drizzled and covered with lid. Ingredients are steam-fried for 5 minutes, and the sauce mixture is added and stirred. It was covered again to rest for a few minutes off the heat. That's it. shaved bonito flakes ("katsuobushi"), thinly-sliced scallion, pickled ginger ("beni shoga"), "La-yu" chili oil, etc. In a small bowl, combine the oyster sauce and soy sauce. Set aside. Heat the sesame oil in the skillet of "Fukkura-san" over medium-heat. Add the garlic and shiitake mushrooms. Sauté until the shiitake mushrooms are soft. Add the cabbage and stir for 30 seconds. Add the bean sprouts and and spread over over the surface. 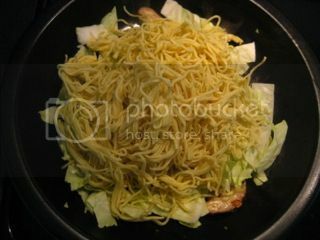 Add the yakisoba noodles to make a mound. Drizzle the sake all over the noodles. Add the sauce mixture and black pepper. Stir quickly. Cover again. Turn off the heat and let it rest for 3 minutes. Uncover and garnish with bonito flakes, scallion, and pickled ginger. Drizzle some "La-yu" chili oil, if you like. So fluffy and so good. 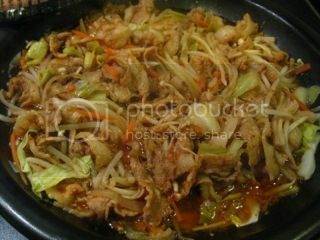 Here is my updated version of pork bulgogi, which is Korean-style spicy marinated pork and vegetables. I use my homemade shio-koji gochujang paste in the marinade, so it gives really nice rich flavor to the dish. Also, my version of bulgogi is much less sweeter than conventional bulgogi. It's got all the natural flavors with a lot of vegetables. A real savory treat with the nice spicy kick. 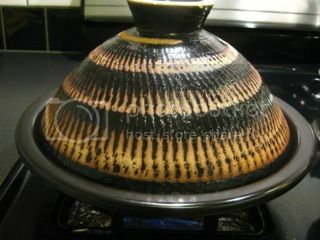 With the tagine-style donabe, "Fukkura-san", the dish can be prepared in easy steps with the wonderful result. Marinade the pork belly slices in the special sauce. Onion was sautéed and cabbage is added. 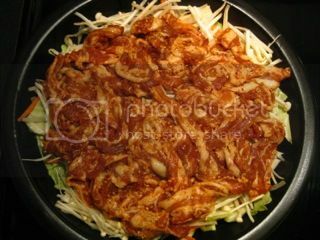 Enoki mushrooms, bean sprouts, and marinated pork are added in layers. Cook for 8-10 minutes. Meanwhile, after 5 minutes or so, stir when the meat is more than half-way cooked. Juicy pork bulgogi is ready! In a bowl, combine the ingredients for the sauce marinade and mix well. Add the pork and mix well by hand. Cover with a plastic and refrigerate for 15-30 minutes. Heat the sesame oil in the skillet of "Fukkura-san" over medium-high heat for 3 minutes. 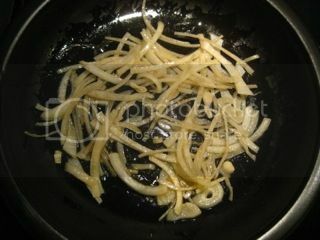 Turn down the heat to medium, and sauté the onion slices for 3-4 minutes or until they are slightly wilted. Add the cabbage, and stir for 30 seconds. 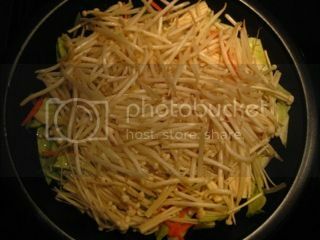 Add the enoki mushrooms and bean sprouts in layers. 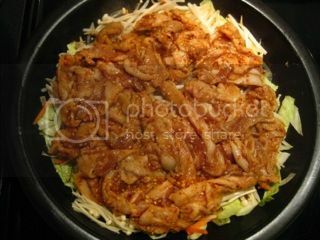 Place the marinated pork on top and spread over evenly. 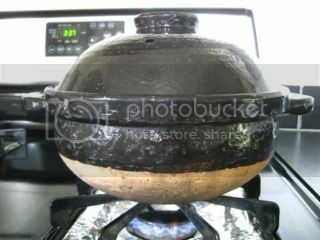 Cover with lid and cook for 8-10 minutes or until the meat is cooked through. Meanwhile, check the doneness and stir 1-2 times after 5 minutes. Turn off the heat and let it rest for 3-5 minutes. Uncover and garnish with the sliced scallion. To serve, divide into individual bowls and squeeze the lemon. 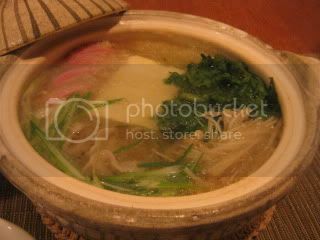 Cod and daikon...what a nice combination and there are so many cooking variations with these two main ingredients with different kinds of donabe. Simple steam-frying them with some butter and yuzu citrus slices is one of my favorites. It's a very easy one pot dish with tagine-style donabe, "Fukkura-san". Since I couldn't find decent yuzu from a store, this time, I made it with meyer lemon, and it was very nice, too! 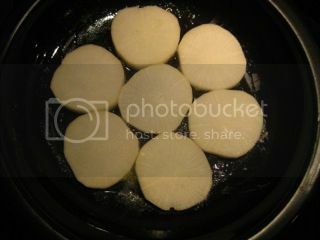 First, daikon slices are pan-fried in butter just like making daikon steaks. 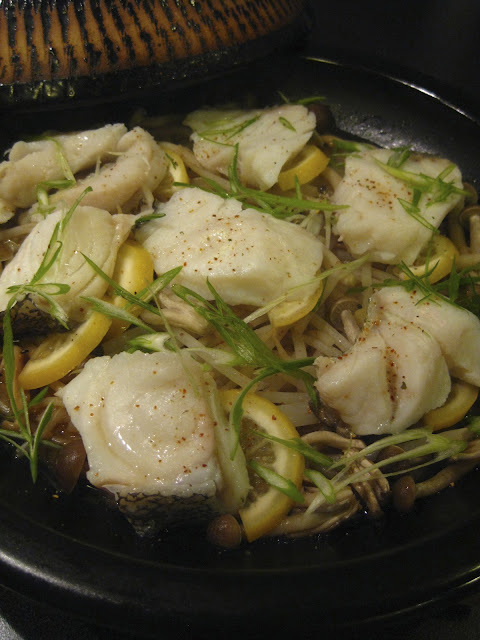 Black cod ("gindara") and meyer lemon slices are added along with bean sprouts and shimeji mushrooms, and steamed in sake for 7-8 minutes. After resting for a few minutes, the dish is ready. So aromatic. Season both sides of the cod filets with 1 teaspoon of sea salt. Refrigerator for 30 minutes. Pat dry with paper towel and set aside. Heat the butter in the skillet of "Fukkura-san" over medium-heat for 2-3 minutes. 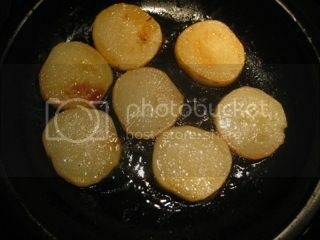 Season both sides of the daikon slices with 1/4 teaspoon of sea salt and add to the skillet in one layer. Cover with lid and steam-fry until the bottom side of the daikon is golden brown (about 4-5 minutes). Turn the daikon over. Add the garlic and ginger in the open space and stir for 1 minute. Add the sake, cover with lid again, and cook for 2 more minutes or until the daikon is just tender when tested with a tooth pick. Add the bean sprouts and spread over the daikon. 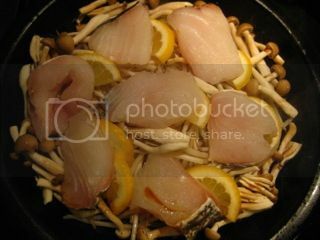 Add the shimeji mushrooms and spread. Add the cod filets and insert lemon slices under cod filets. 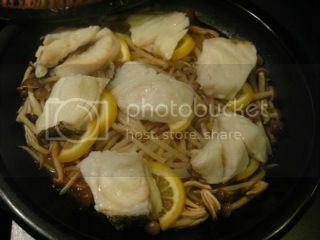 Drizzle the soy sauce, cover with lid, and cook for 7-8 minutes or until the fish is just cooked through. Bring "Fukkura-san" to a dining table. Uncover and garnish with the scallion and some shichimi togarashi. Serve immediately. Serving option: If you like even bigger flavor, after divided into individual bowls, drizzle some ponzu sauce to enjoy. When I'm home alone and too tired to cook but still want to eat something good, donabe can make a wonderful one-pot meal. 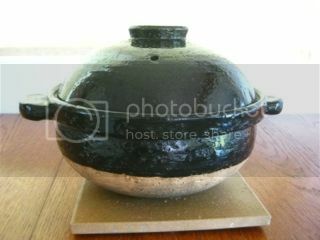 My cute mini-size classic-style donabe, "Rikyu-Tokusa" is a perfect size for 1 person. Last week, I made this daikon broth with shabu shabu slice pork and tofu dish 2 nights in a row, because I just loved the taste and simplicity of the dish so much. It's so healthy, too. My body feels so happy after I eat this dish. The broth is "mizore" style with the grated daikon and stock. "Mizore" means "sleet", because the look and texture of grated daikon resemble it. I combined the same volume of vegetable stock and grated daikon to make the broth, and heated with tofu and enoki mushrooms. I used half-day sun-dried enoki mushrooms, so that they give more umami flavor when cooked slowly. But, the fresh enoki mushrooms can be used, too. Shabu shabu slice pork and kamaboko (Japanese fish cake) slices are added once the broth started simmering. Shungiku (chrysanthemum leaves) and scallion are added at the end. What a comforting dish! 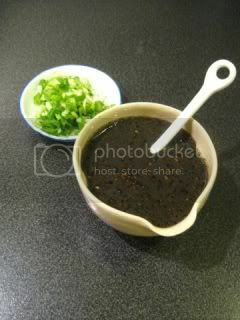 In donabe, combine the vegetable stock, grated daikon, ginger, sake, and soy sauce. Add the tofu and enoki mushrooms. Bring to simmer over medium heat. Add a little salt to adjust the seasoning, if necessary. Add the pork and kamaboko, and continue to simmer. Once the pork is barely cooked through, add the shungiku and scallion. Simmer for 1 minute. Serve immediately. To enjoy, serve a small amount into a bowl at a time and dab a little amount of yuzu kosho or kanzuri to the tofu, pork, or broth to enjoy. 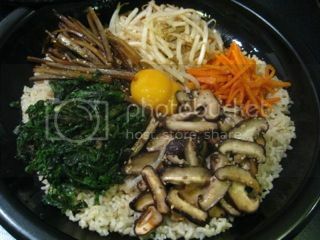 When we have dinner guests at home, we sometimes makes donabe bibimbap, and it's always a big hit. 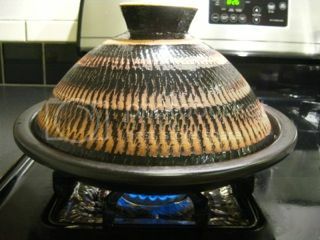 We cook the rice in the double-lid donabe rice cooker, "Kamado-san", and assemble the rice and toppings in the tagine-style donabe, "Fukkura-san", for a nice sizzling effect. People often fight for the crusty part of the rice! For this dish, I like to make with brown rice. 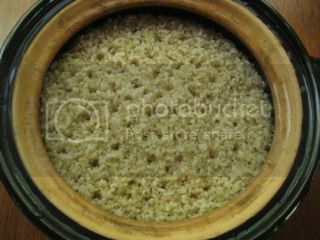 I partially polish the whole brown rice at home with my home rice polisher, so that the brown rice can cook just like white rice. But, if you don't have a home polisher, you can find partially-polished brown rice at Japanese market, or you can also make whole grain brown rice...it's always gorgeous. 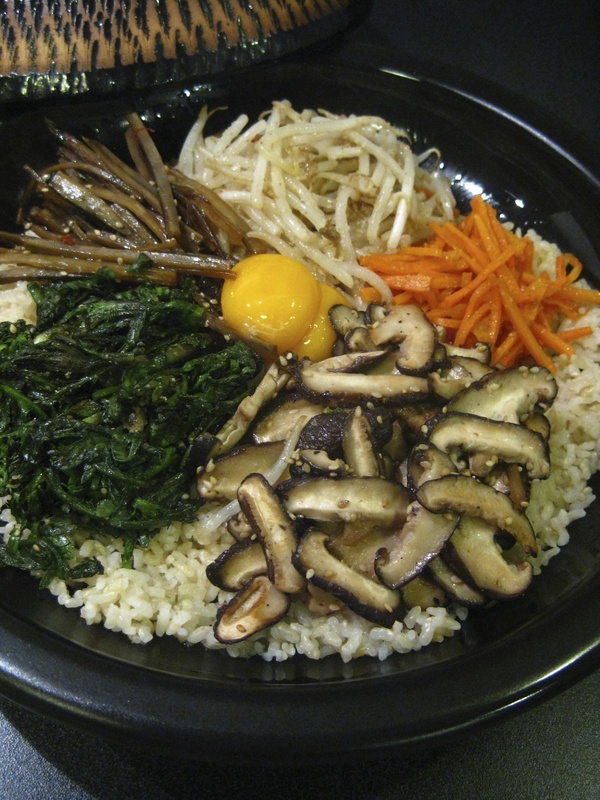 Vegetable "namul" toppings are prepared separately. Cooked rice is transferred to "Fukkura-san", and topped with the vegetable "namul" toppings. Once the rice starts sizzling and the crust is made in the bottom, egg yolks are placed in the center and ready to be presented at the table. Gochujang paste and sliced scallion are added and everything is mixed together before being served into individual bowls. 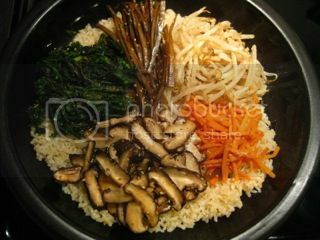 Here's the update recipe of my "Sanchae Bibimbap" or Korean-style vegetable mixed rice. In "Kamado-san", combine the rice and water, and cook according to the basic plain rice instructions. 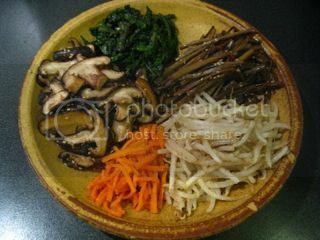 Meanwhile, prepare the "namul" (vegetable salad) toppings. 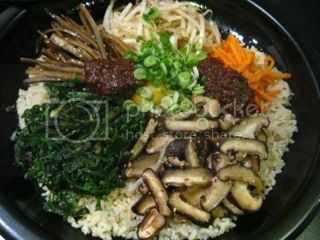 In a small bowl, whisk together the ingredients for the "namul" dressing. Set aside. (Bean sprout "namul") Blanch the bean sprouts in boiling water for 10 seconds. Drain well. Mix with 1 tablespoon "namul" dressing. Set aside. 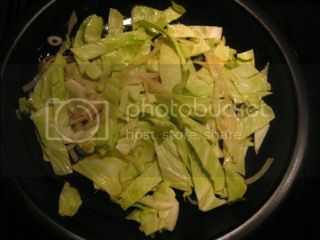 (shungiku "namul") Blanch the chrysanthemum leaves in boiling water (salted) until wilted (5-10 seconds). Drain and rinse in cold water. Gently squeeze out the excess moisture and cut into 2" (5 cm) long. Mix with 1 tablespoon "namul" dressing. Set aside. (carrot "namul") Blanch the carrot in boiling water for 45-60 seconds. Drain and pat dry. 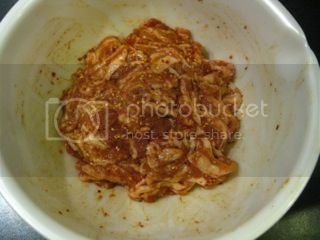 Mix with 1/2 tablespoon "namul" dressing. Set aside. 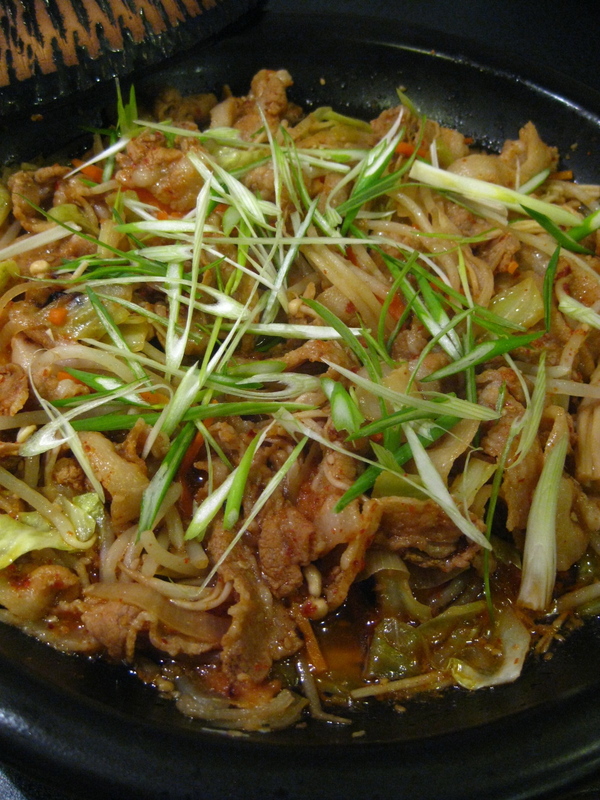 (gobo "namul") In a saute pan, heat 1 tablespoon olive oil and sauté the burdock root over medium heat for a few minutes. Add the sake, mirin, and soy sauce. Cover again and cook until the burdock root is tender and the liquid is reduced to almost nothing (10-15 minutes). Meanwhile, stir a few times. Turn off the heat. Add the sesame seeds and stir. Transfer to a plate and set aside. (Shiitake "namul") Wipe the sauté pan. 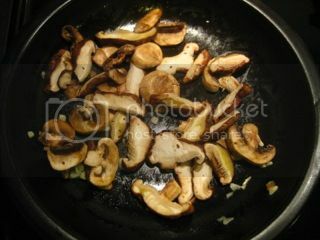 Heat 1 tablespoon olive oil and sauté the shiitake mushrooms over medium heat for until they are soft (3-4 minutes). 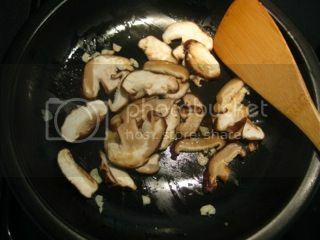 Add the sake and continue to sauté until the mushrooms are cooked through. Add a pinch of salt and the sesame seeds. Stir again. Turn off the heat and transfer to a plate and set aside. To assemble, Heat 1 tablespoon sesame oil in the skillet of "Fukkura-san" over medium-high heat for 3 minutes. Make sure to coat the oil evenly over the entire surface of the skillet. Turn the heat down to medium, and add the cooked rice from "step 1". Spread evenly to the inner edge of the skillet. Add all the "namul" vegetables one by one and spread evenly over the rice. 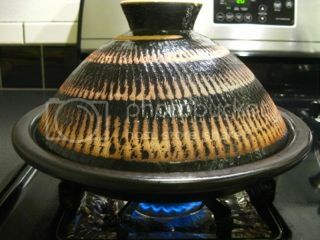 Cover with lid and cook for 4-5 minutes or until the the rice is sizzling. (If you are not sure of the doneness, you can open and carefully check the bottom side of the rice by using a spoon to make sure the bottom is nicely browned.) Turn off the heat and let it stand for 3-5 minutes. Uncover, place 2 egg yolks in the center. Add the scallion and 3 tablespoons of gochujang and mix well with a large spoon. Add more gochujang if you like and mix again. Serve immediately. 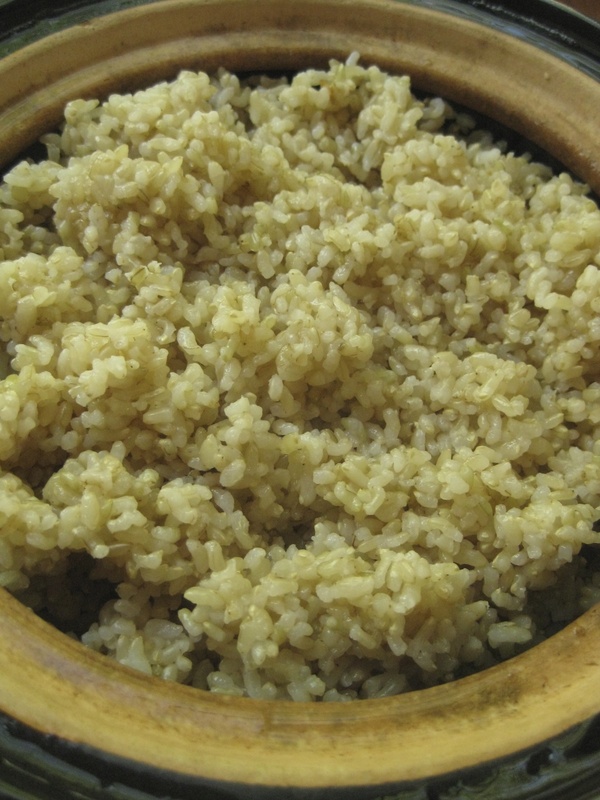 In the recent years, growing number of people choose to eat brown rice over white rice, because brown rice is considered to be much healthier than white rice. And, I find many of them don't necessarily like the taste of brown rice more than white rice. I hope such people will try making brown rice with double-lid donabe rice cooker, "Kamado-san", because, in my opinion, there is nothing compare to it. Period. Luckily in the US, we can find a variety of decent quality rice which are grown in California. My choice is Koshihikari variety short grain rice. Koshihikari is one of the top quality rice varieties (originally) from Japan. New crop rice has higher content of moisture, compared to old stored kinds. 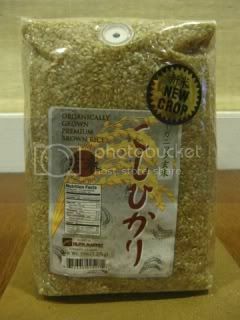 This one in the picture is a short grain Koshihikari whole brown rice, which is available at Nijiya Market. 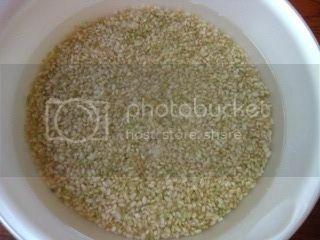 For the whole grain brown rice, after rinsing it, I normally soak 10-12 hours in filtered water with a pinch of salt. This small addition of salt will help reducing the bitter flavor from the rice. The general suggested ratio is 3 rice-cup (540 ml) whole brown rice to 900 ml water. But, because it's a new crop, I reduced the water amount down to just about 840 ml, so the rice water ratio is almost 1 : 1.5. 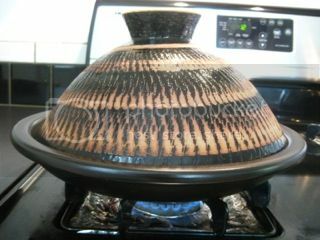 Rice and water are transferred to "Kamado-san" and cooked for 35-38 minutes over medium-heat. Once the heat was turned off, the rice was rested in "Kamado-san" for about 35 minutes. 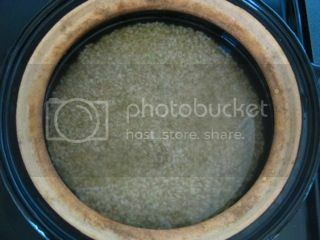 Then, when I finally removed both lids to see the beautifully-cooked brown rice. 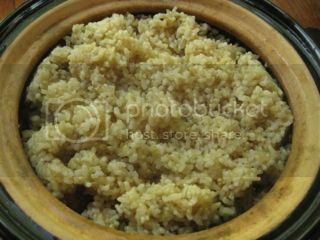 Whole grain Koshihikari brown rice cooked in donabe turns so fluffy but has the nice chewiness and sweetness in the mouth. I always love it and never get tired of it. I don't even need any condiments for this.